Providing you with a fast, efficient and cost-effective service. Giving you instant and unlimited downloads for your products and creating bespoke health and safety documents at your request. We offer great service, high quality H&S documents, free advice and online training courses that are second to none. If you've got any questions or can't find what you're looking for, get in touch. We're here to help and if we can, we will. Download free templates and examples then use the video tutorials to create your own Risk Assessments, Method Statements and COSHH Assessments or browse through our catalogues and download what you need. Don’t want to create your own documents? Have a look at our BEST OFFERS and you’ll see why these unique packages that can’t be found on any other website are our best sellers. They simply tick all the right boxes. If you're looking for something specific, use the search feature to filter your results. Visit our E-Learning Centre and discover the ease of use we've built into the on line training facility. Explore the E-Learning multi-user interface. Allowing you to purchase courses for multiple people with each person having their own unique login details. Get training certificates at a time and pace that suits you. We’re so confident in our products that we're giving away three completed documents. A Method Statement, a Risk assessment and a COSHH Assessment. Furthermore, we also give away three templates which have accompanying video tutorials, allowing you to create your own documents for free should you choose. And when we say try before you buy we really mean what we say. Every document in our BEST OFFERS section is available to read. Not just a sample page, but every single page. Go take a look and try before you buy. Either use the site as a guest and simply buy documents as you need them, or, register (Recommended). Registering with HSE Docs allows you to download the documents you have ordered as many times as you wish and also ensures that your documents are safely stored on our secure servers. 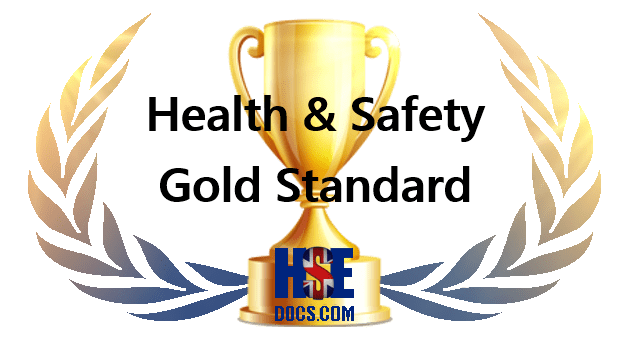 Having over 20 years’ experience in the Health & Safety industry and with highly trained staff and consultants, HSE Docs produce high quality yet concise documents as well as delivering quality, affordable training via our E-Learning Centre. All our documents are available for instant download and are in Word™ format, meaning they are editable, allowing our clients to insert their own company logo, project details, signatures and dates. It’s the responsibility of business owners to uphold health and safety procedures, which, without the correct knowledge can be a complex and daunting task. HSE Docs understand this and that you need a fast, efficient and cost-effective service, which we strive to help you achieve. To complement our online document service, we have an E-Learning Centre where you can purchase and carry out certified online training courses. We believe strongly in family values, building business and trust. For questions or comments, please use our contact form. We look forward to hearing from you soon. Located: opposite The Hilton Hotel. West End.